Botswana is a land-locked country with no mountain ranges and only low-lying hills. As a result, it has no endemic birds and only one near endemic, Short-toed Lark, which also occurs in neighboring South Africa. Despite this, it is a fascinating country to visit and to bird. Botswana is still very much wild Africa, where animals are not habituated much to tourists and tourism is far less than in East Africa. It definitely has it's attractions. Over 500 species of birds occur in the country, of which about 110 are not found in Kenya and 84 are not found in Tanzania. Birdlife is more similar to neighboring South Africa and Namibia. Botswana is a very safe country to visit, an added attraction compared to some places in Africa. The most visited areas in Botswana are the Chobe River area and nearby Okavango Delta in the north. Game viewing and birding are both spectacular in these areas. General tourists mainly visit during dry season from May-October, especially during October when game animals congregate around permanent water. October also happens to be the hottest month of the year. The best time for birding is during rainy season when birds are in breeding plumage. Botswana is a fairly arid country and many birds follow the rains. Even during rainy season it doesn't rain every day and it typically rains mostly in late afternoons. Exploring the Chobe River swamps and Okavango Delta by boat is very worthwhile during this time of year. Another very worthwhile place to visit is the Central Kalahari Game Reserve, best visited after the seasonal rains begin. It should be noted that it doesn't rain every year, and in dry years the Kalahari is very parched and devoid of both wildlife and bird life. During the rainy season game viewing including a Wildebeest migration that is second only to the one in East Africa is excellent. So also is the birding. The Kung Bushmen, for which the Central Kalahari reserve was created, often act as guides and scouts for visitors, and it's possible to go on night game viewing excursions when predators are most active on private lands adjacent to the reserve. 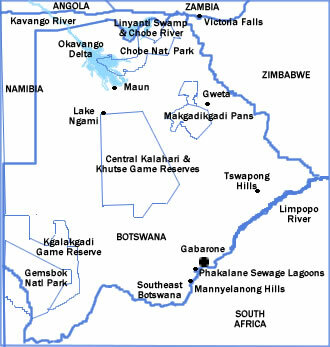 A third area of considerable interest is the Gabarone area in eastern Botswana. It's possible to visit a nearby nesting colony of Cape Griffons, a species with vulnerable IUCN status. It's also possible to see the near endemic Short-clawed Lark in the SE Botswana IBA about 100km south of town. Botswana is a less visited country where the animals are still unhabituated to people and wild Africa is still very much a reality. There are no endemic birds and only one near-endemic, but the birdlife is quite different from east Africa and more like South Africa. Botswana is a very safe country for travel, unlike many parts of South Africa, and combined with a birding tour to Namibia opens up a whole new vista of what Africa is like. Most tourists visit Botswana during dry season from May-October, with peak season in October. At this time of year travel overland is more possible, especially in seasonally flooded areas, game animals congregate around the limited permanent water, and the grass is shorter which makes game viewing easier. There are also fewer mosquitos and other insects, which can be more of a problem during rainy season. On the other hand, birds are mainly in breeding plumage during the rainy season, which makes November-March the best time for birding. The heaviest rains are in January and February, when boats are more necessary in the Okavango Delta. Even during rainy season, it does not rain every day and the rains mainly occur in late afternoon. Visits to central Botswana, especially in the Central Kalahari Game Reserve, are only worth-while during the rains. At other times of year, this area is hot and desolate with few birds or other game animals to be found other than near permanent water. The Makgadikgadi Pans can be visited by land only during dry season, when the area is fairly desolate, but viewing some 30,000 flamingos from the air during rainy season is fantastic. Areas adjacent to the pans around permanent water are very good during dry season when grassland birds can be seen. Perhaps the best months for birding in Botswana are November, December, and March, when the rains are less than January and February and birding is spectacular.